Bud's has an 11 year proven track record as the number one online firearms retailer. We have an A+ rating with the Better Business Bureau, 99.8% positive Ebay feedback and a 99% positive Gunbroker feedback. 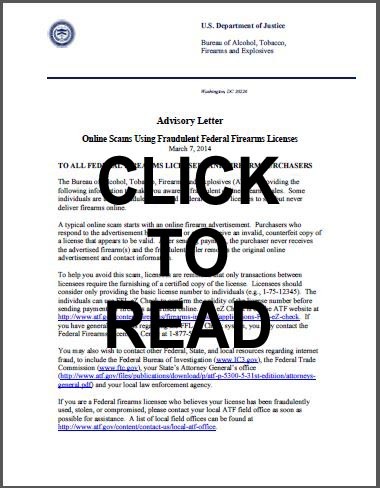 According to the ATF there are online scams to be concerned about (see below). With our proven history you never have to worry when you purchase with Buds. If you aren't familiar with us or want to check us out, please feel free to verify before you buy. To do so, please visit the ATF's FFL eZ-check website to verify our FFL number (4-61-04955). To go a step further and to ensure that the firearm you purchase with us will be transferred to a legitimate dealer, please choose one of our Preferred dealers when placing your order. We've verified their license for you. We will ONLY ship to a dealer that we've verified with eZ Check. While you're at it check out the Norton Shopping Guarantee that Bud's provides for every purchase. It is unequaled in the industry. Buy with Bud's for the peace of mind that you're buying with a legitimate online retailer that does the homework to ensure your firearm will ship to a legitimate dealer. Your purchase is guaranteed.